Can A Background Process Impact A Foreground Process And Its Database Time? Clearly background and foreground processes operate in parallel. I don't think any DBA would deny this. As I frequently say, "serialization is death and parallelism is life!" A simple "ps" command will visually show both Oracle background and foreground processes at work. But this in no way implies they do not impact each other's activity and performance. Using my OSM realtime session sampler tool (rss.sql - related blog posting HERE) I sampled the log writer every half a second. (There is only one log writer background process because this is an Oracle 11g database, not an Oracle Database 12c system.) If the log writer session showed up in v$session as an active session, it would be picked up by rss.sql. Both "ON CPU" and "WAIT" states are collected. Here is a sample of the output. Is Oracle Database Time Correct? Something Is Not Quite Right. If you do the fundamental math, you'll notice the numbers don't always add up. In fact, they rarely match. In this posting, I want to demonstrate this mismatch and I want you to see this on your systems! I'll include experimental data from a number of different systems, the statistical analysis (including pictures) and provide a tool you can download for free from OraPub.com to check out the situation on your systems. DB Time is defined as "time spent in the database." This is the sum of Oracle process CPU consumption plus non-idle wait time. Usually we don't derive DB Time. The Time Model Statistics view v$sys_time_mode contains the DB Time statistic. But this view also contains the DB CPU statistic. Since there is no sum of non-idle wait time, most people just assume everything is fine. If you add up the DB CPU and the total non-idle wait time, the value is 351,346.877. Woops! 351K does not equal 330K. What happened on my Oracle Database 12c (12.1.0.2.0)? As I have demonstrated in this POSTING (which contains videos of this) and in my online seminar training HERE, many times DB Time does nearly equal DB CPU plus the non-idle wait time. But clearly in the above situation something does not seem quite right. To demonstrate the possibility of a DB Time mismatch, I created a simple plsql tool. You can download this free tool or do an OraPub.com search for "db time tool". The tool, which is easily configurable, takes a number of samples over a period of time and displays the output. OraPub DB Time Test v1a 26-Sep-2014. Enjoy but use at your own risk. All displayed times are in seconds. The output is formatted to make it easy to statistically analyze. The far right column is percent difference between the reported DB Time and the calculated DB Time. In the above example, they are pretty close. Get the tool and try it out on your systems. I want to quickly show you four examples from a variety of systems. You can download all the data in the "analysis pack" HERE. The data, for each of the four systems, contains the raw DB Time Test output (like in the section above), the statistical numeric analysis output from the statistical package "R", the actual "R" script and the visual analysis using "smooth histograms" also created using "R."
About the columns: Only the "craig" system is mine and other are real production or DEV/QA systems. The statistical columns all reference the far right column of the DB Time Test Tool's output, which is the percent difference between the reported DB Time and the calculated DB Time. Each sample set consists of eleven 180 second samples. The P-Value greater than 0.05 means the reported and calculated DB Time differences are normally distributed. This is not important in this analysis, but gives me clues if there is a problem with the data collection. As you can easily see, two of the system's "DB Times" difference is greater than 10% and one of them was over 20%. The data collected shows that something is not quite right... but that's about it. What Does This Mean In Our Work? Clearly something is not quite right. There are a number of possible reasons and this will be focus of my next few articles. However, I want to say that even though the numbers don't match perfectly and sometimes they are way off, this does not negate the value of a time based analysis. Remember, we not trying to land a man on the moon. We try diagnosing performance to derive solutions that (usually) aim to reduce the database time. I suspect that in all four cases I show, we would not be misled. But this does highlight the requirement to also analysis performance from a non-Oracle database centric perspective. I always look at the performance situation from an operating system perspective, an Oracle centric perspective and an application (think: SQL, processes, user experience, etc.) perspective. This "3 Circle" analysis will reduce the likelihood of making a tuning diagnosis mistake. So in case DB Time is completely messed up, by diagnosing performance from the other two "circles" you will know something is not right. Paper. Total Performance Management. Do an OraPub search for "3 circle" and you'll find it. Online Seminar: Tuning Oracle Using An AWR Report. I go DEEP into an Oracle Time Based Analysis but keeping it day-to-day production system practical. In my next few articles I will drill down into why there can be a "DB Time mismatch," what to do about it and how to use this knowledge to our advantage. Enjoy your work! There is nothing quite like analyzing performance and tuning Oracle database systems!! In an Oracle Database 12c instance you will likely see multiple log writer (LGWR) background processes. When you first start the Oracle instance you will likely see a parent and two redo workers. This is a very big deal and something many of us have been waiting for - for many years! While I'm excited about the change, if I can't control the number of LGWRs I could easily find myself once again constrained by the lack of LGWRs! So, my question is how do I manipulate the number of LGWRs from the default. And what is the default based on? It's these types of questions that led me on this quest. I hope you enjoy the read! 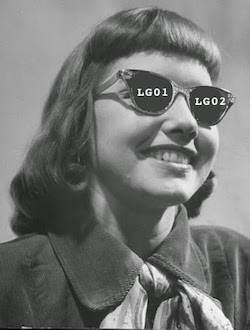 Multiple LGWRs is great news because serialization is death to computing performance. Think of it like this. A computer program is essentially lines of code and each line of code takes a little bit of time to execute. A CPU can only process N lines of code per second. This means every serial executing program has a maximum through capability. With a single log writer (LGWR) background process the amount of redo that can be processed is similarly constrained. Suppose a CPU can process 1000 instructions per millisecond. Also, assume through some research a DBA determined it takes the LGWR 10 instructions to process 10 KB of redo. (I know DBAs who have taken the time to figure this stuff out.) Given these two pieces of data, how many KB of redo can the CPU theoretically process per second? This is a best case scenario. As you can see, any sequential process can become a bottleneck. One solution to this problem is to parallelize. Note: Back in April of 2010 I posted a series of articles about parallelism. If you are interested in this topic, I highly recommend you READ THE POSTS. Very Cool! Multiple 12c LGWRs... But Still A Limit? This is important. While this is good news, unless Oracle or I have the ability to change and increase the number of LGWR redo workers, at some point the two redo workers, will become saturated bringing us back to the same serial LGWR process situation. So, I want and need some control. Interestingly, starting in Oracle Database version 12.0.1.0.2.0 there is an instance parameter _use_single_log_writer. I was able to REDUCE the number LGWRs to only one by setting the instance parameter _use_single_log_writer=TRUE. But that's the wrong direction I want to go! I tried a variety of CPU related instance parameters with no success. Always two redo workers. More Redo Workers: More Physical CPUs Needed? While talking to some DBAs about this, one of them mentioned they heard Oracle sets the number of 12c log writers is based on the number of physical CPUs. Not the number CPU cores but the number of physical CPUs. On a Solaris box with 2 physical CPUs (verified using the command, psrinfo -pv) upon startup there was still on two redo workers. More Redo Workers: Adaptive Behavior? It looks to me like Oracle has programed in some sweeeeet logic to adapt the numbers of redo workers based the redo load. So I created six Oracle sessions that simply inserted rows into a table and ran all six at the same time. But it made no difference in the number of redo workers. No increase or decrease or anything! I let this dml load run for around five minutes. Perhaps that wasn't long enough, the load was not what Oracle was looking for or something else. But the number of redo workers always remained at two. It appears at instance startup the default number of Oracle Database 12c redo workers is two. It also appears that Oracle has either already built or is building the ability for Oracle to adapt to changing redo activity by enabling and disabling redo workers. Perhaps the number of physical CPUs (not CPU cores but physical CPUs) plays a part in this algorithm. While this was not my research objective, I did discover a way to set the number of redo workers back to the traditional single LGWR background process. While I enjoyed doing the research for this article, it was disappointing that I was unable to influence Oracle to increase the number of redo workers. I sure hope Oracle either gives me control or the adaptive behavior actually works. If not, two redo workers won't be enough for many Oracle systems. Like most of you reading this, you have a, let's say, unique sense of humor. 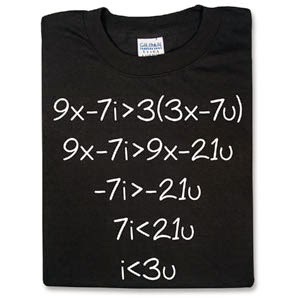 I stumbled across the ultimate geek website that has an astonishing variety of t-shirts aimed at those rare individuals like us that get a rush in understanding the meaning of an otherwise cryptic message on a t-shirt. I picked my Top 5 DBA Geek T-Shirts based on the challenges, conflicts and joys of being an Oracle DBA. 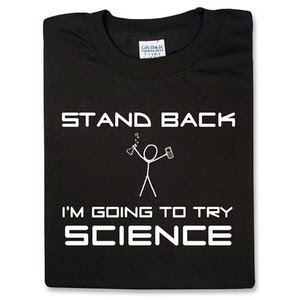 With each t-shirt I saw, a story came to mind almost immediately. I suspect you will have a similar experience that rings strangely true. According to Slash Data the top password is now "Password". I guess the upper-case "P" makes people feel secure, especially since last years top password was "123456" and EVERYBODY knows thats a stupid password. Thanks to new and improved password requirements, the next most popular password is "12345678". Scary but not surprising. As Oracle Database Administrators and those who listened to Troy Ligon's presentation last years IOUG conference presentation, passwords are clearly not safe. ANY passwords. 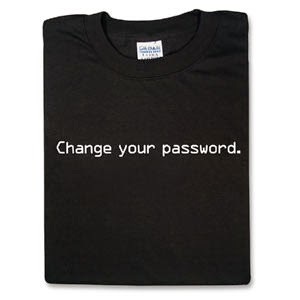 Hopefully in the coming years, passwords will be a thing of the past. Because it has worked on our other systems. I did a Google search and an expert recommended this. Because the box is out of CPU power, there is latching issues, so increasing spin_count will help. Because we have got to do something and quick! 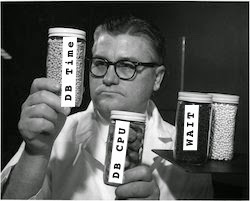 I teach Oracle DBAs to think from the user experience to the CPU cycles developing a chain of cause and effect. If we can understand the cause and effect relationships, perhaps we can disrupt poor performance and turn it to our favor. "Showing your work" and actually writing it down can be really helpful. Why do managers and users think their presence in close proximity to mine will improve performance or perhaps increase my productivity? Is that what they learn in Hawaii during "end user training"? What's worse is when a user or manager wants to talk about it...while I'm obviously in concentrating on a serious problem. 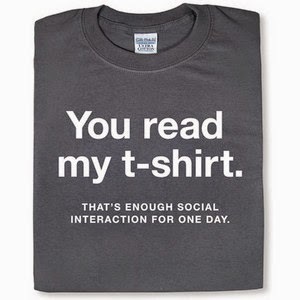 Perhaps if I wear this t-shirt, stand up, turn around and remain silent they will stop talking and get the point. We can only hope. Obnoxious but true. Why do users wonder why performance is "slow" when they do a blind query returning ten-million rows and then scroll down looking for the one row they are interested in.... Wow. The problem isn't always the technology... but you know that already. Hint to Developers: Don't let users do a drop down or a lookup that returns millions or even thousands or even hundreds of rows... Please for the love of performance optimization! One of my goals in optimizing Oracle Database performance is to be quantitative. And whenever possible, repeatable. Add some basic statistics and you've got science. But stand back because, as my family tells me, it does get a little strange sometimes. But seriously, being a "Quantitative Oracle Performance Analyst" is always my goal because my work is quantifiable, reference-able and sets me up for advanced analysis. So there you go! 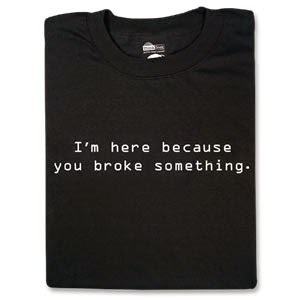 Five t-shirts for the serious and sometimes strange Oracle DBA. Not only will these t-shirts prove and reinforce your geeky reputation, but you'll get a small yet satisfying feeling your job is special...though a little strange at times.